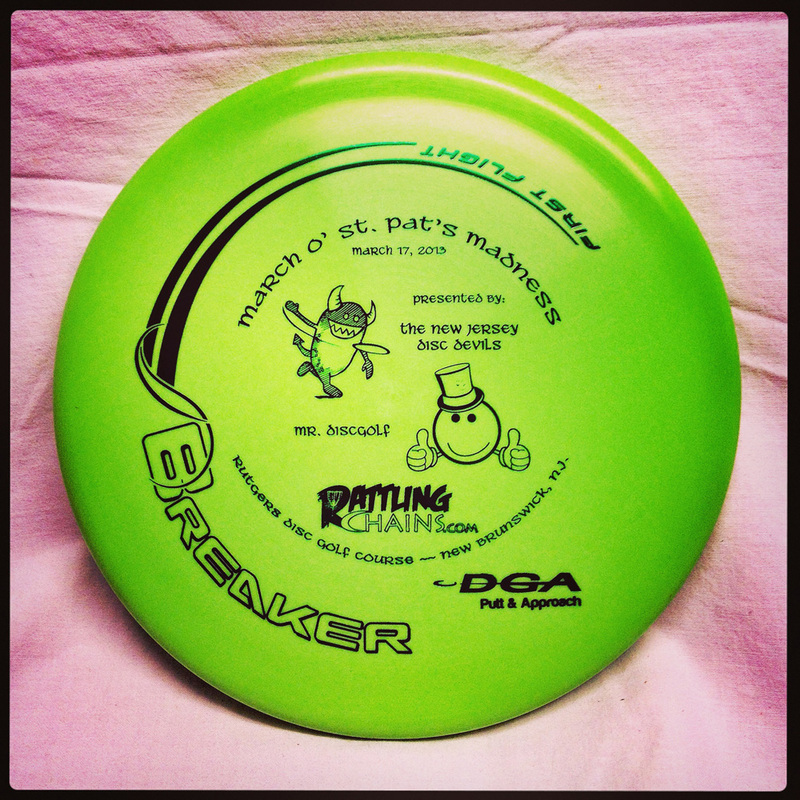 Rattling Chains was lucky enough to be one of the sponsors for a tournament that had the DGA Breaker as part of a player’s pack. In fact, it was the first tournament to have the Breaker with a custom tournament stamp. Still, if the disc doesn’t deliver, then it’s nothing more than eye candy. When I play in tournaments, I usually find the nicest disc with the tournament stamp and keep it. I don’t throw it at all, rather allow it to become a wall-hanger to show what tournaments I’ve played in. Usually, I hope it’s a disc I’ve already thrown or own. I was lucky enough to be able to grab more than one disc from this tournament, which allowed me to have something to throw, too. I’m not one to get into technical details of a disc. As barely a 700-rated player, my disc choices are based on feel and what the disc does for me. And I’m digging the Breaker. With a lower — and flatter — profile and a different feel to the underside, I wasn’t sure what it would do for me. But it fit what I was looking for — a putt-and-approach disc I could use in multiple situations. What I really like about it is it doesn’t seem to do anything silly once it lands. Within 100 feet or so, I usually use the Innova JK Aviar. I still will use it as it’s reliable, but the Breaker is going to start pushing its way into play. The reason being is when the Breaker heads toward the basket and slides in, it stops. The Aviar, as well as a few others I’ve used, will sometimes hop up and bounce or roll away. The Breaker didn’t do that. I’m not saying it’s not possible for it to do it, but it hasn’t in the times I’ve used it. For me, that’s enough to put it in the bag. Nature is something most disc golfers can relate with. And it’s probably safe to say most disc golfers have had a close-up and intimate relationship with trees at some point during their playing days. But it’s not too often when one gets to throw a tree. That’s what you get when you throw a Flywood disc. 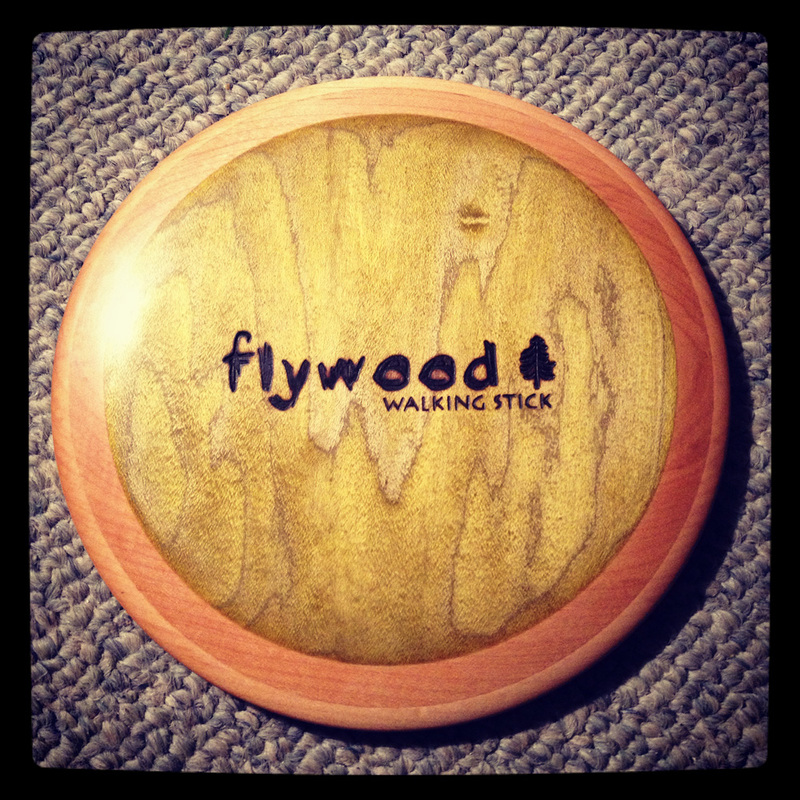 The Flywood Walking Stick is a fun disc to throw and the sounds it creates are quite unique. The Pennsylvania-based company sent Rattling Chains three discs to test — all the driver called The Walking Stick. Though I had learned about the company a bit when we ran the story about Flywood, it still wasn’t the same as seeing what the disc was all about. As many may know, I’m not a long thrower. 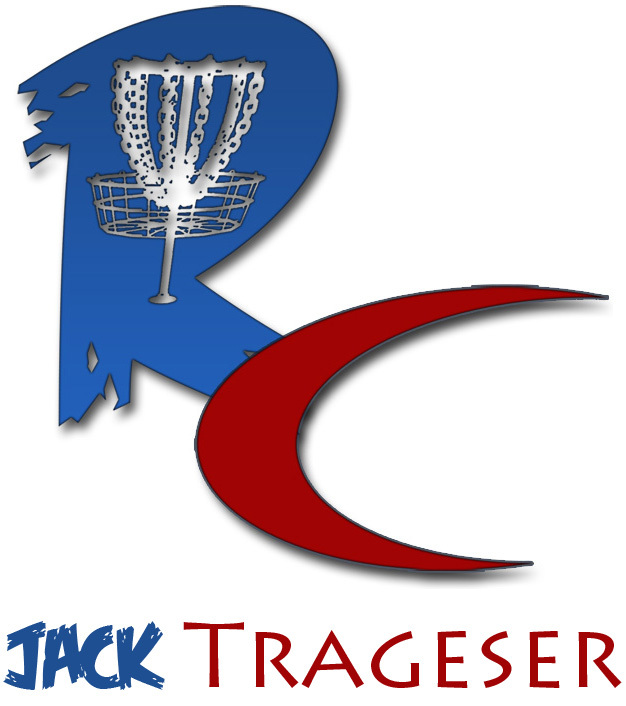 So I usually go based on feel and how things seem to come out of the hand on a throw when trying out discs. The Walking Stick was quite interesting and I really liked the feel of it. I was worried at first because it’s wood. But it actually felt lighter than a regular disc. It had a nice look and the sound is something pretty cool, too. I also liked the way it came out of my hand. I didn’t think it felt all that different with discs I normally play with and thought it remained comfortable throughout the motion and release. As for how it flies, it did what many drivers do for me (as a right-handed-backhand thrower), it got out 200 or so feet and broke hard to the left. I threw it many times and got some nice throws, but for the most part, it broke hard. To a better thrower, I can imagine it being something really to use during round not sanctioned by the PDGA. The only thing I’m curious about? What happens in six to eight months if the disc gets beat up some? Is it like a plastic disc where the flight characteristics change? Or does it hold the same line. I’ll be excited to find out. The disc itself needs a little more care than the regular plastic. One needs to clean it and wax it sometimes to make sure it stays protected. The discs come with the wax needed. I’m not going to lie, either — one of the coolest things? The sound. When it hits a tree or the chains. It’s not what a disc golfer is used to. There are times it sounds like a baseball bat hitting a ball. Definitely cool and one will be easily able to tell where the disc may have gone based on the sound. The wax is needed to keep your disc healthy. Eventually, I hope to try out the mid-range and putter offered by Flywood. I think those will be more toward my style and something I can use a bit more. I will keep working with this disc in the hopes of being able to utilize these discs for many casual rounds. Though they are a bit on the pricey side ($30 per disc), the discs are made by hand and show the personal love. Our discs came hand numbered, including with a card showing the information about the disc. A great touch that separates smaller companies from the big boys. In the end, it’s a cool disc. Is it perfect? No. But I’ve yet to see a perfect disc. It’s a solid addition to a casual bag and the quality is unmatched. Mix that with the personal touches and what the disc can do, and it’s definitely worth having. 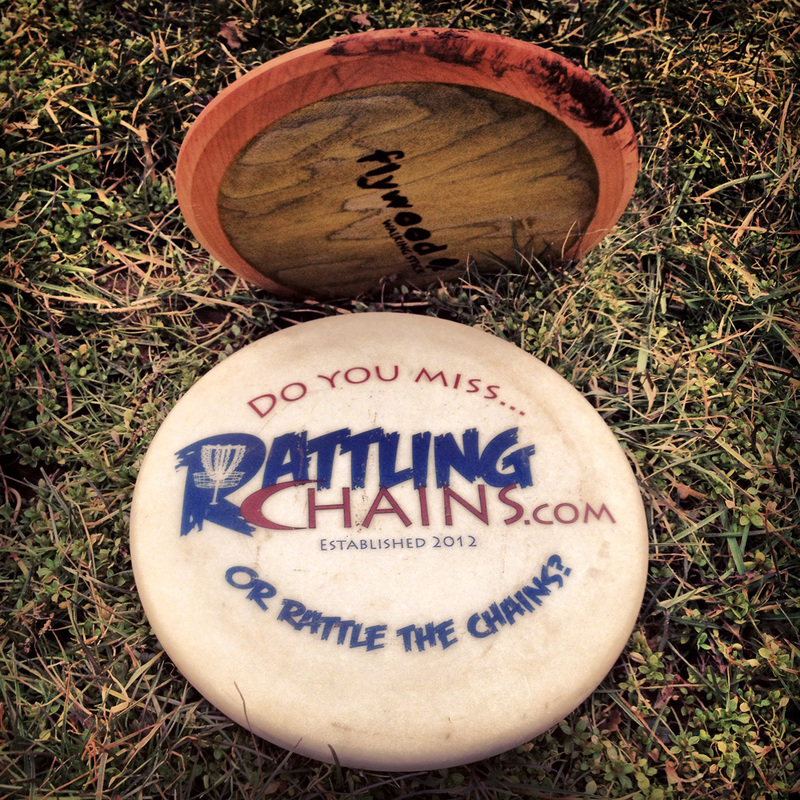 I usually get pretty excited for any new discs we get to review for Rattling Chains. After all, when a company takes the time to recognize what we do, and we get to try something for free, I’m all for it. But I don’t think any release – with respect to other manufacturers, of course – had me as excited to get to the mailbox as the Flywood Walking Stick. After reading a little about the discs online, and then watching the video on Flywood’s website, I had a feeling we were going to be receiving something special. True, the disc isn’t PDGA-approved, which might be a drawback for some. But, with a two-year-old at home and the family commitments that come with that, I play maybe one PDGA-sanctioned event per year. As a result, I can throw whatever I want and not have to worry about it fitting the standards. 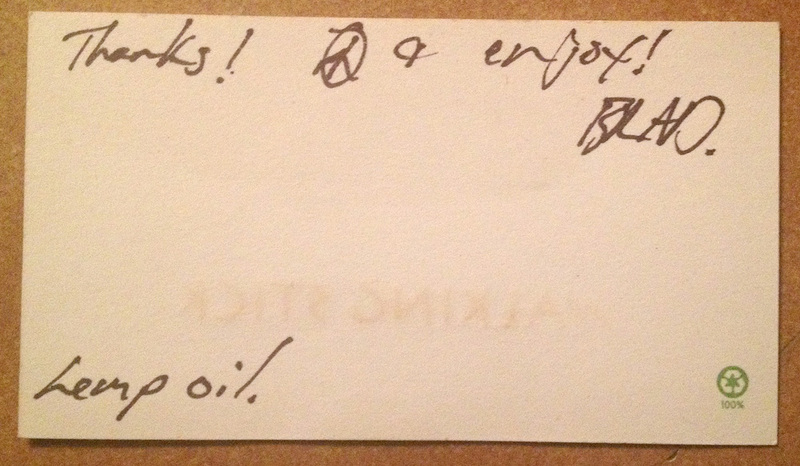 Flywood’s discs come with a nice and personal touch. And I am glad I don’t have to do that, because the Walking Stick is a tremendous piece of hardware. 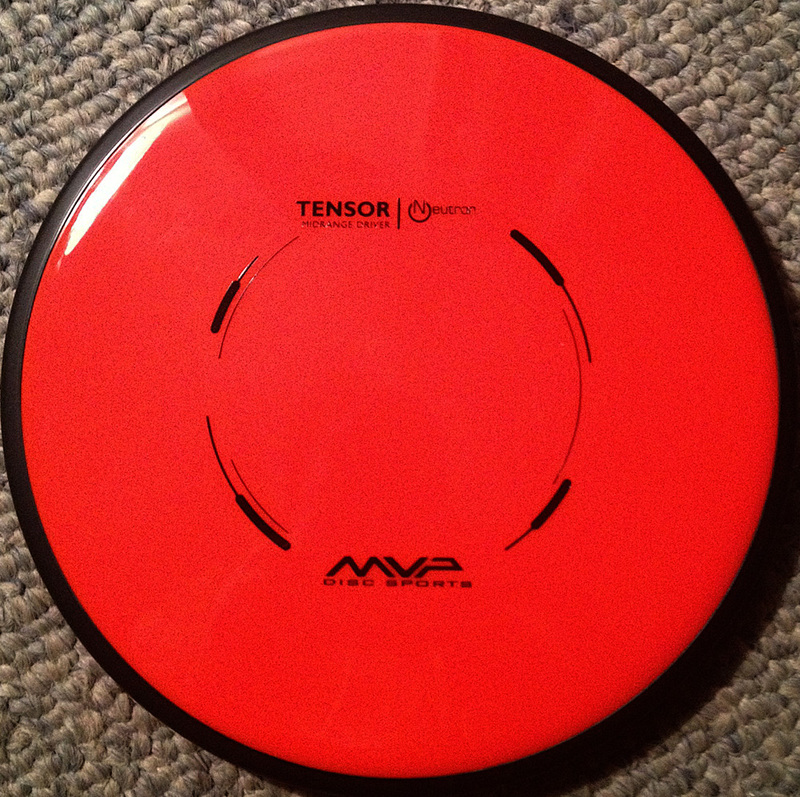 The disc I received had a delicious, candy apple red finish to it, and it weighed in at 172 grams. However, in the hand it feels much lighter than a plastic disc of the same weight. Perhaps it is due to the material, or the multi-ply construction – I’m not sure. But it feels light in the hand. My main concern with this disc – which I am sure others are worried about, too – was that it would feel uncomfortable ripping out of my hand on a drive. With it being made of wood, and therefore being less flexible, I was concerned that it might result in some distressing callouses. I am happy to report, though, that the finish on the disc, particularly on the rim – is smooth and easy to release. As for the flight, this may be one of the only discs that I have ever been able to make replicate its flight chart. On a good rip, the Walking Stick would fly dead straight for about 65% of the flight, then start to make a gentle, late turn before fading out at the end of its ride. When I didn’t really dial it in, it was still plenty useful, with a straight-then-fade flight reminiscent of an Innova Teebird. It can easily be a workhorse off the tee. However, out of the box it is still too stable to hold an anhyzer line. As a result, it was great for flex shots, but certainly couldn’t be a one-disc-wonder. Rather, an understable complement would pair nicely with it. There is, though, one major downside to this disc – it is too pretty for me to want to throw. I’m worried about clanging it off of the rocks that line some of my home course’s fairways and taking dings out of it. I just want to keep it in mostly pristine condition and hang it on the wall to stare at. Maybe it is time to add another Walking Stick to the collection – one for the bag, one for decoration. It truly works well for both purposes. 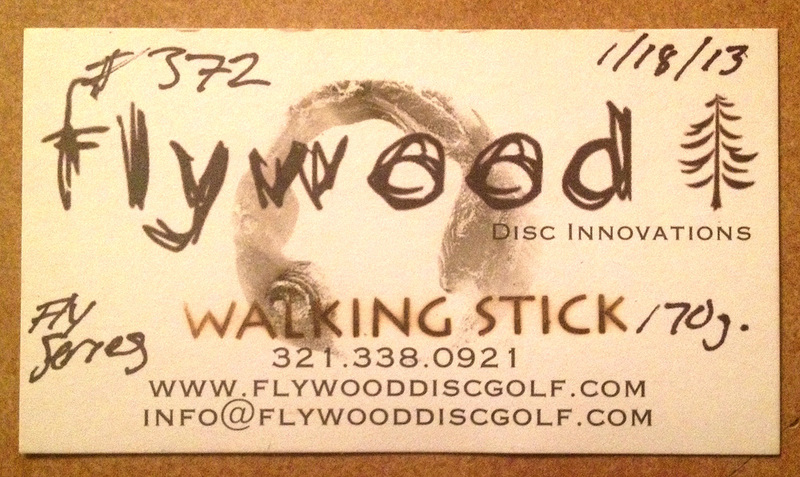 When I first became aware of Flywood disc golf discs, my initial reaction was intense curiosity. Wooden discs that are meant to be thrown and used in actual disc golf play? I always get excited about anything in disc golf that truly breaks new ground. However, I’m first and foremost a competitive player, and after a quick check I realized that a disc made of wood would never be approved by the PDGA for use in sanctioned events due to the inherent rigidity of the material. Right away it was clear that these discs are not going to be “game-changers” that break records in terms of distance or control. That would be pretty cool though, wouldn’t it? It would be the opposite of what happened in ball golf when titanium drivers replaced woods. Regardless of my discovery that wooden discs would not be vying for a spot in my competition bag, I was still eager to see how one looked, felt and flew. When mine arrived in the mail, I have to admit I was impressed. 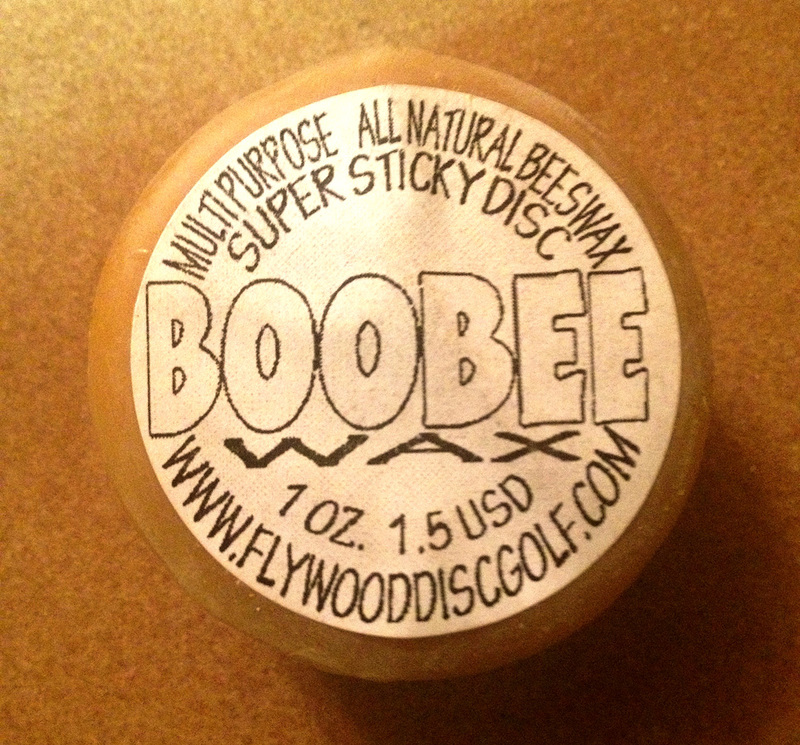 The company’s driver, The Walking Stick, came packaged with Boobee wax, which is used to improve the grip, and, I suspect, when applied to their putter it also helps (at least a little) to grab the chains. I’m not sure, but guessing that is also verboten according to PDGA rules as well. Another great touch is that the disc has a card attached that actually numbered my disc (#371) and dated it as well. This was a great reminder that I didn’t just have another disc on my hands, but a handcrafted work of art. I’ll finish by returning to this point, but for now I’ll just say this is where I think Flywood can get the most traction with its products. When it was time to take my Walking Stick out for a test, I picked an area where it would land on nothing but soft grass. I know, ideally, I would have tested it for durability as well as flight characteristics, but I just couldn’t bring myself to purposefully inflict damage on such a work of art. Unfortunately I don’t have much positive to say about the flight of the disc, except that it did indeed fly like a golf disc, and it was reasonably stable. But compared to plastic or rubber discs, it didn’t seem to have much sail or float to me, wanting instead to plunge back to earth as soon as the energy I put into the throw had dissipated. Also, as the disc released from my power grip, there was noticeable discomfort. The inner edge feels smooth enough to the touch, so I suppose this is due to the rigidity of wood. It seems to me that Flywood has two different markets for its disc — the first is a small subset of the disc golf crowd, players who care deeply about the environment and desire that as many products as possible that they use and consume be completely natural. If you love disc golf but have issues with petroleum-based plastics, these discs are your answer to being able to make an already environmentally-sensitive sport even more so. The other market for Flywood — and the one I’d think could make these discs quite popular — consist of people who feel that the flying disc is an ideal subject for all forms of art. I love the idea of a hand-crafted disc, especially if it’s master-crafted the way these are. 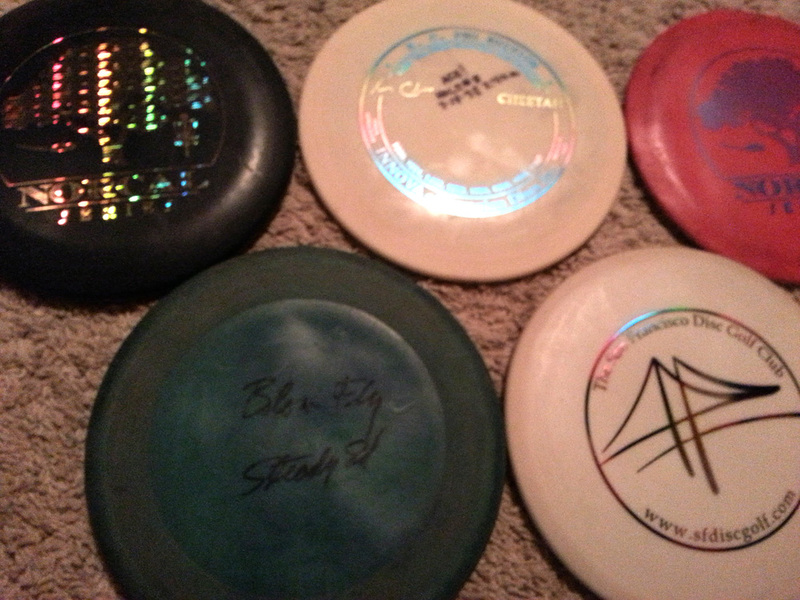 If you’re the type that collects all things disc golf, the price tag of $30 is well worth it for what you get. Just imagine having a perfectly shaped wood disc on your wall along with all your other wall discs. Which one do you think will catch a visitor’s eye first? Exactly. 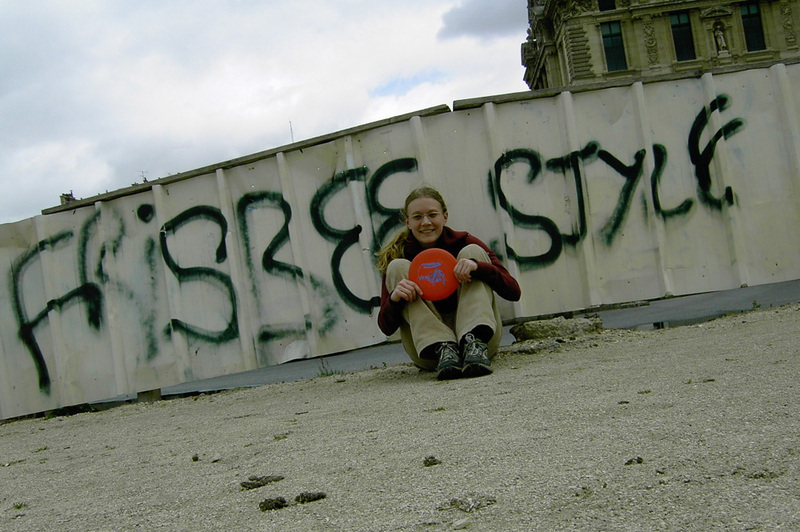 Jenny Cook in front of some Frisbee-themed graffiti in France. To the average person, a sewer cap might represents all that is nasty and dirty and, simply doing its job to keep the sewer system below our streets. Personally, I look at it as an opportunity to capture a photograph. I am thrilled when I stumble upon ones with the name of the city on top of the cap. Being in a foreign city or country, I also like to use the opportunity to place my CE Valkyrie on the cap, next to the city name, snap a photo and move on. I once found myself on an eight-hour layover in Paris, France. Once landing, I rushed out of the airport, hopped into a taxi and asked them to take me to the Louvre Museum. In an all-too quick visit, I ran past the Monets and the Mona Lisa, which is much smaller in person, by the way. With a map in hand, I exited the museum and looked for the Eiffel Tower. Trekking to the famous tower, I stumbled upon some graffiti on a temporary construction wall. The words said “Frisbee Style” and gave me a perfect photo opportunity. I grabbed a disc out of my bag — a must for my carry-on — and propped my camera on my backpack, set the timer and sat down in front of the wall for a photo, disc in hand, of course.